The “World Council Meeting”, held at the historic seat of Fraglia Vela Riva with the members of the international class J24 and the representatives of other world classes (including the Italian Pietro Diamanti and Fabio Apollonio), has officially disclosed that the J24 World Championship 2018 will take place in Riva del Garda from 24th to 31st August, which will follow the National Championships of the same class scheduled middle May. 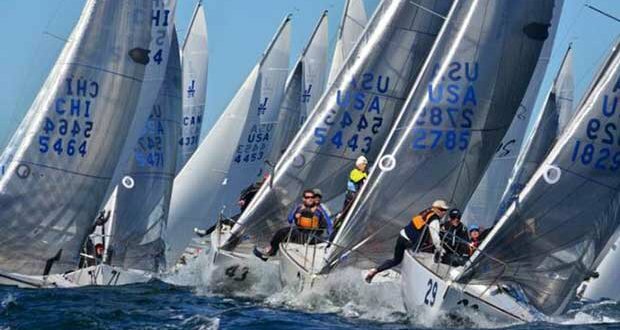 “It is a pleasure to host once again the J24 fleet for its major events as the Italian Championships (Open) in May and the Worlds at the end of August – stated the Fraglia Vela Riva’s President Giancarlo Mirandola and added, “this class is part of the sailing history and reveals to be lively and spread worldwide. After having hosted the 1999 and 2009 Nationals here in Riva del Garda, it is a great honour to organize the World Championship in 2018. Our club turns out to be up to this kind of major sporting events by granting the high standards requests of the international class, not only in term of logistics”. “The Fraglia Vela Riva’s representatives showed the members of the international class and the J24 presidents the facilities of the club, pinpointing the range of possibilities for the moorings of the boats, the trailers parking, and the services offered to the competitors – explained Pietro Diamanti, J24 Italian president – particular attention is payed to the venue of the gauge the tonnage, since Tim Winger, Technical Chair of the international class, asked for an indoor space sheltered from the wind in other to prevent any mistake in the gauging. Hence, the tonnage gauging will be located in the near PalaVela building part of ‘Riva del Garda FiereCongressi’”. After the tour of the club, the participants of the “World Council Meeting” acknowledged the suitability of the facilities and appreciated the professional competence of Fraglia Vela Riva in running world events. Moreover, it was decreed that the World Championship will have a limited participation number of 80 boats. The Italian fleet, as hosting nation, has the right to entry 24 pre-selected boats and one boat for the former World Champion, one for the 2017 Italian Champion, one female team, one youth team (under 25) and two boats of the organizing club.